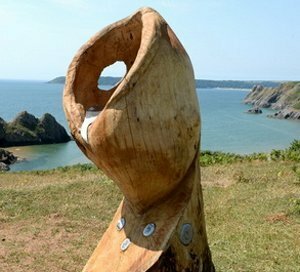 Showcasing contemporary Welsh arts in an adventurous and inspiring way, spot the five Wales’ Year of the Sea themed sculptures as you follow the Gower Coast Path between Mumbles and Rhossili. The ever flowing circle of water featuring a large mackerel has been hand carved from local reclaimed oak. The viewfinder it creates at the centre allows people to focus and observe the ever changing beautiful landscape throughout the seasons. Insets of hand modelled cast aluminium illustrate the different shells that live in British waters, providing both informative and educational information. Lettering has been carved into the wood to direct walkers to the nearest bay. 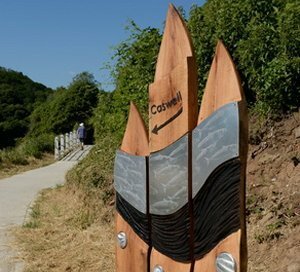 A dynamic set of three surfboard inspired pieces stand either side of a bench on the cliff path from Caswell to Langland. They have a variety of textures within the form of a flowing current connecting all the pieces together. Dark charred waves contrast the shawl of metal fish and the warm colour of the oiled oak. Hand carving illustrate the directions to both beaches and insets of hand modelled cast aluminium illustrate the different shells that live in British waters. Based on a whelk shell to work with the landscape complimenting the location. The shell is carved from one piece of wood, including the ‘plinth’. There is a view finder in the back of the shell which can be fixed to a chosen view. Also, an aluminium mirror inside the shell acting as a ‘rock pool’ reflecting light and a spiral. The rock pool overflows into the spiral ‘logo’ on the front of the sculpture. At the base of the carved shell the ‘cast’ shells are fixed. 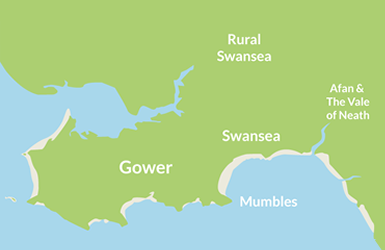 The plinth will have arrows slowly changing into birds (gulls) pointing and flying towards the path that takes you to the beach with Three Cliffs Bay carved into it. 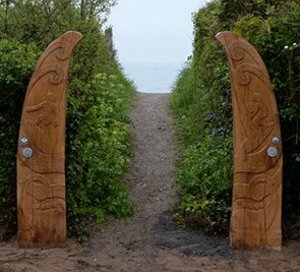 The carved wooden arch has been erected at the start of the footpath marking the way to the beach at Horton. Based on water sport activities popular at this beach, one side of the arch depicts a windsurfer and the other a surfer with wave form designs also carved as a mirror image on both sides. 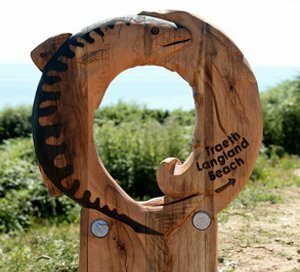 The words Traeth and Beach have been carved into the arch and some cast local shells plus spiral logo are embedded in the sculpture. The arch is created from one curved piece Oak wood split in two to create the mirrored sides. 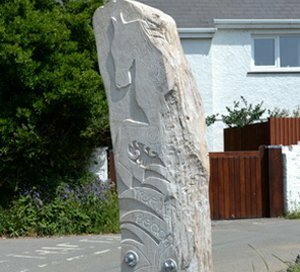 The carved oak piece depicts “a white horse”, a poetic description of the surf, to reflect the power and beauty of the waves at Rhossili, a popular surfing spot on Gower. The racing horse and waves have been carved into the way marking sign with text Traeth and Beach pointing to the beach path. Insets of cast shells and spiral logo have been embedded into the design. Images Copywrited to Sculpture by the Sea UK / Phil Holden. For more information, please visit the Art and Education by the Sea Website.